If you didn’t receive candy or chocolate for Valentine’s Day, it’s probably because 1-800-Flowers ruined your day and possibly your life. The flower company left hundreds of people hanging by delivering broken or wilted flowers last Friday and, in many cases, absolutely nothing at all. Just ask Vy Nguyen who helped her father order a bouquet for her mother to be delivered at her office, but nothing ever came, reports CNN Money. "It's been a very frustrating experience," said Vy Nguyen of South Carolina…. ”We tried to do something nice for my Mom and she ended up with no flowers on Valentine's Day and she was very upset as she should be." Nguyen said she called 1-800-Flowers multiple times, but the automated phone system hung up on her. She sent several emails and finally got a response after she sent a publicly-visible message on Twitter. When she finally did speak to someone at 1-800-Flowers, Nguyen says she was offered a free “apology arrangement” but then even that was retracted by the company’s help line. Now she’s expecting her refund and a $20 voucher for her next purchase, but Nguyen says she’s through with the company, obviously. With their head office in Long Island, it is possible that 1-800-Flowers’ deliveries were ruined by last Thursday’s snow storm on the east coast, but who knows. Still, as a national brand, shouldn't one be prepared for inclement weather, especially if the news reports that snow and torturous cold are inevitable? 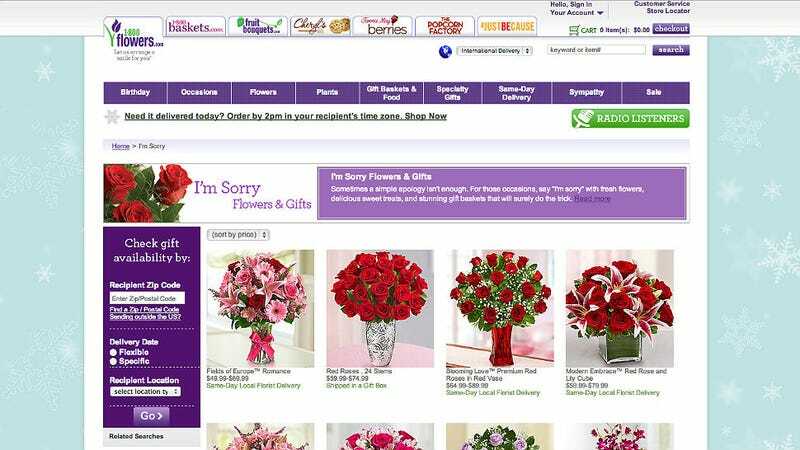 Elsewhere back on the 1-800-Flowers website, the company has yet to rectify all of their misdeeds with their unhappy customers, but they have already moved on to advertising post-Valentine’s Day ‘Are you in the doghouse?’ flowers. Perhaps they should send a bouquet or 800 on their own behalf.